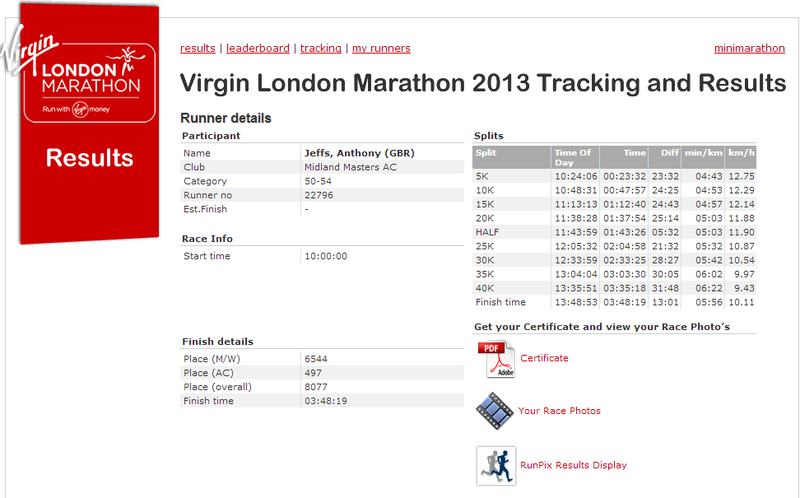 It looks a though only Tony Jeffs completed the marathon and that Andrew Hope was a dns. Below is Tony’s Report on the day and his split times and finishing time ……………….. Well Done and congratulations. I wanted to thank you for guiding me through the club application process for The London Marathon this year. I was fortunate in being offered a club place and wanted to tell you what a fantastic experience it was for me in successfully completing my first London Marathon. The whole weekend was fabulous with most of the family coming to support myself and Trevor Allport (brother in law) also a MMAC member. On the Saturday we all did our own thing around London and came together for a meal in the evening. Then an early night for the boys to rest up, whilst the youngsters (supporters) drank for a little longer to get their strength up for the long day ahead! After a hearty breakfast Trevor and I set off to our start point (blue) where all the elite and wheelchair runners were started from. I could not get over the size of the event, and I have never seen so many portaloo’s in one place ever before! But the organisation was so slick and everything seemed so calm considering how many were there. The day was fine, warm and sunny and the banter was uplifting. Before the race we stood shoulder to shoulder in silence to remember the week’s events before at Boston all wearing our black ribbon with pride. I have to confess I was very emotional throughout the whole day due to the level of support the crowd gives you. I had my name printed on my shirt and literally hundreds of total strangers called it and offered encouragement, it was incredible, and I did my best to acknowledge them all. I wanted a time of 3:30 and set out well ahead of pace running around 3.15, which was to become a mistake. I felt good at 12 miles and then I met my family on the course just before TowerBridge. I found it so emotional I didn’t want to leave them. The crowd kept me going through that section and no doubt I have never experienced anything like it and they certainly drove me on. I have been the other side of the barrier many times in supporting Trevor, and I know it’s a special and exciting feeling when you spot a runner you know. But running and seeing family was almost overwhelming emotionally. At the top of the incline after TowerBridge I felt my legs go heavy and my stride turned to a shuffle with no back lift and I began to slow. The next 10 miles were very long but I was not going to stop. From 22 miles I knew I could finish but I was now running 3.45 pace and my earlier advantage was gone. I realised it, yet it didn’t matter, I was enjoying the spotlight as we came into the final few miles. I met the family again at Westminster which made me cry again, but by then it was almost done. I plodded over the line at 3:48:19 with an exhausted expression and very tired and sore feet. Trevor managed a magnificent 3:13:35, which is good for age standard. It was the best marathon I have ever experienced (my 7th) and I would do it all again tomorrow if I could! Yes it a takes a few months to prepare and the winter we had did not help, but the training and build up makes the final event so much more than just a race. It was an experience, one I shall always cherish. So thank you to the Midland Masters Athletic Club for allowing me to run on their behalf, I am extremely grateful. Thank you! It is definitely an great webpage.